Dutch researchers have demonstrated a mechanism by which an artificial increase in the light of the day creates a predisposition to obesity. It turns out that under the action of light suprachiasmatic nucleus less actively stimulates brown fat to absorb and burn lipids. A less lipid burning brown fat, the more fat is deposited in white. Thanks to the invention of electricity, we can choose their own mode and not depend on the change of light and dark periods of the day. Many people awake at night – either because these are the conditions of their work, or because they prefer this mode. Light day for waking people at night as it is extended – to the usual bright hours of the day are added to the artificial. A recent large-scale study involving 100,000 women found that this way of life is harmful for rather unexpected reasons: women who spent the night under artificial lighting (because either awake or sleeping in a lighted room), obesity is often observed (see. E . McFadden et al., 2014. The Relationship Between Obesity and Exposure to Light at Night: Cross-Sectional Analyses of Over 100,000 Women in the Breakthrough Generations Study). These interesting results can come up with different explanations. First, if a person is at night by the light, the more likely he is awake, because I prefer to sleep with the light, only a small percentage of people. We can assume that people awake at night eat more (many people know what to eat at night – it’s a special pleasure) or less exercise (night – not the most convenient time to perform jogging or fitness club). But whether obesity occur not because of the indirect effects of regime change, but because of itself increase the light of day? 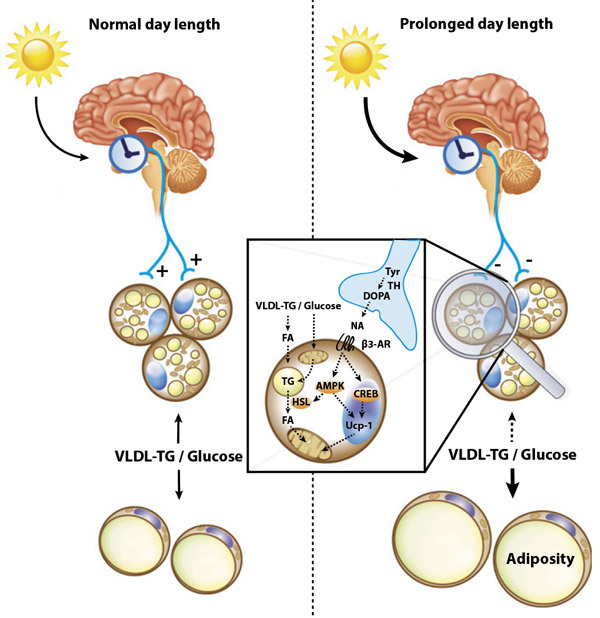 Dutch scientists decided to conduct an experiment on mice to test does not cause an artificial lengthening of daylight hours some changes in metabolism due to which there is a predisposition to obesity. Scientists have reason to think that a change in the light of day can affect metabolism. It is known that the suprachiasmatic nucleus in our brain monitors the light cycle, and sends signals to the periphery, so that all cells of the body can adjust its internal clock. In accordance with the readings of clock changing intensity of many important processes – for example, the uptake of glucose, which is dependent on insulin sensitivity, which in turn varies with the progress of the biological clock (day insulin sensitivity is lower than the night). Depends on the time of day and the number of synthesized proteins, phospholipids and DNA – the parameters that are important for all cells without exception (day processes of synthesis of these molecules are more active than at night). Conclusions about the mode in which the body must work today, the suprachiasmatic nucleus making based on signals of the light coming from the cells of the retina. It would be natural to assume that because of the night-time lighting suprachiasmatic nucleus falls into error and sends signals to the cells to work in “day” mode, although the body at this time is assumed to sleep. And these signals man nocturnal receives day and night, and because of that he can “float” the regulation of many processes. In the experiment, the mice were divided into three groups: the first group of dark and daylight were of equal duration, in the second light day was extended (and lasted 16 hours), and a third day lasted all day. In mice, there was a similar situation: the longer was their daylight hours, the more fat they postponed (after 5 weeks, the mice that lived under constant illumination, were one and a half times thicker than the mice in which daylight is equal to night). Mice can eat as they wanted, but it was found that mice with a 16-hour light day ate no more mice 12 hours, the mice that lived under constant illumination, ate at all the least. It turns out they have a obesity is not due to overeating. Total time activity in mice at the extended photoperiod did not decrease, so that the lack of movement was not the cause of weight gain. It remains to find a mechanism by which the length of daylight could affect the metabolism. There is no doubt that this involved the suprachiasmatic nucleus of the body as the main pacemaker. Indirectly, this area of ​​the brain affects all body cells, but the direct links it forms not so much. It is noteworthy that the suprachiasmatic nucleus is directly related neural pathways with brown fat – tissue that burns lipids to receive heat and warm the body. In contrast, white fat cell, which stores lipids brown fat cells actively combusted these molecules in numerous mitochondria. Interestingly, the brown fat cells originate from the same precursor as muscle cells, and in some ways resemble them, they should also not store and process reserves, producing heat (and muscle cells produce useful work). Scientists have suggested that the lengthening of daylight suprachiasmatic nucleus regulates the wrong brown fat and burns it is not so much lipids as it could. To test their hunch, the researchers tracked the tagged lipid molecules in experimental animals. It turned out that the extension of daylight brown fat absorbs lipids from the blood less. To test the role of the suprachiasmatic nucleus in the process, the scientists cut in experimental animals neural pathways from the brain to this part of the brown fat. After such an operation has become brown fat to absorb up to five times less than the lipids from the blood. It turns out the signals from the suprachiasmatic nucleus to stimulate brown fat to absorb lipids. Day of such signals receives less (normal brown fat is to burn lipids at night, when it’s cold). And if the brown fat absorbs less of lipids, the large number of them will be delayed in normal white fat. In addition, in the daytime in the brown fat decreased expression Thermogenin and decreased activation of the enzyme hormone-sensitive lipase. It turns out that afternoon brown fat not only absorbs less of lipids, but also burns them less active. And Thermogenin expression and activation of hormone-sensitive lipase dependent on norepinephrine signals from the suprachiasmatic nucleus. That is, the longer daylight hours, the less brown fat burns lipids and the more their stores of white fat. Thus, the length of daylight affects the rate of accumulation of fat reserves. It should be mentioned that during the year daylight naturally changes, the stronger the farther away from the equator is a point of our planet. In December, for example, on South Pole (and the surrounding area to the south of 23.5 degrees south latitude) day lasts all day (and at the North Pole this month, on the contrary, the sun is not visible at all). People who live in these conditions, the progress of the internal clock is disturbed and may manifest insulin resistance and increases the amount of triglycerides (a type of lipid) circulating in the blood (see . : J. Arendt, 2012. Biological rhythms during residence in polar regions). These factors may contribute to obesity, but accurate data on how predisposed thereto explorers working with “broken clock”, we do not. Due to the harsh living conditions at the poles of the people, on the contrary, likely to lose weight. In any case, the change in weight – it is not the main problem of those who work in the polar night and polar day; much trouble for them, sleep disorders and depressive disorders (similar to normal seasonal depression, see. Seasonal affective disorder). Therefore, the need to adjust the length of daylight by artificial means in such cases, when the situation is far from normal, no one doubts.